The tri-state area is dealing with more snow and freezing rain, making for a messy a.m. commute on Tuesday. A winter weather advisory is in effect through much of the region, with a mix of snow, sleet and rain that started to fall around 10 p.m. The wintry mix will fall until around 9 a.m., the National Weather Service predicts. A developing area of low pressure moving along the Atlantic seaboard should bring in warmer air, which will make this mostly a rain event later Tuesday, forecasts predict. Frigid temperatures are on tap overnight, with a low around 20 degrees, but the afternoon will turn significantly warmer -- around 40 degrees. Rain is in the mix through Wednesday morning. The early morning wintry-mix will make for slick conditions during the rush hour commute, so use extra caution. 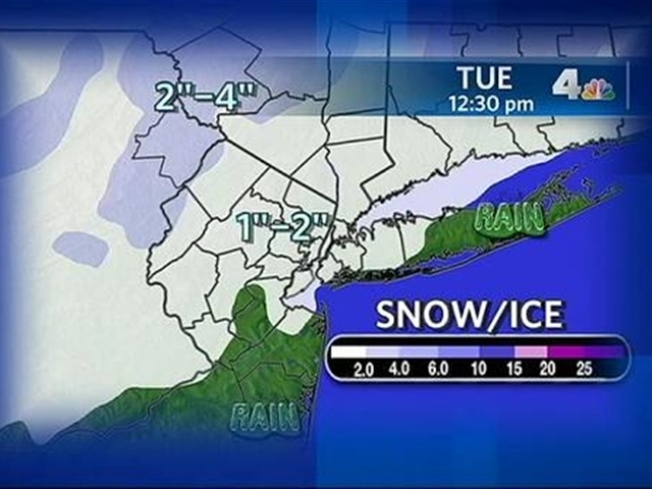 There is a winter weather advisory in effect for New York City, Nassau and Suffolk Counties. One to two inches of snow are expected. Winter storm warnings are in effect for Ulster, Orange, Putnam, Dutchess, Gree and Columbia counties. Two to four inches of snow are a quarter inch of ice are expected by early Tuesday. In New Jersey, a winter storm warning has been issued for counties including Sussex, Warren, Morris and Northern Passaic. This will be the fourth snow storm of the season. Snow from the after Christmas blizzard is still on the ground around the region, unable to melt as temperatures remain around the freezing mark. After a brief warm up to around 40 degrees on Tuesday and Wednesday, the end of the week will again turn very cold, with highs around 28 degrees on Thursday and Friday.